A couple of fun ATCs for the CBC October swap. The theme is any thing beginning with O or the month October. No stamping just stickers and rub-ons for these two but I kinda like them. They are the same size but I took the photo at a jaunty angle so my shadow would not be over them. 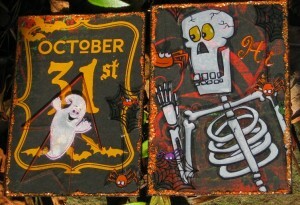 This entry was posted in ATC, CBC swap, Halloween, October by Jackie. Bookmark the permalink.